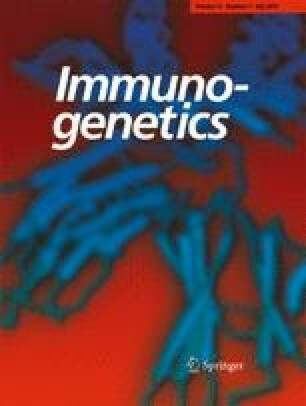 Human CD7 (hCD7) is a 40 000 M r member of the immunoglobulin gene superfamily that is expressed early in natural killer (NK) and T-lymphocyte development. CD7 is involved in lymphocyte activation, as ligation of CD7 activates NK and TCRγδ T lymphocytes, and ligation of CD7 on TCRαβ T lymphocytes induces a non-mitogenic calcium flux. We have previously cloned and characterized the gene for human CD7 (hCD7) and have described its expression in transgenic mice. Recently a mouse cDNA homologous to hCD7 was reported, which we mapped to the corresponding mouse chromosomal location as hCD7. We now report the identification and characterization of a mouse CD7 (mCD7) genomic clone. We demonstrated that the mCD7 gene was similar both in size and structural organization to hCD7. Comparison of the 5′ flanking sequences of the mCD7 and hCD7 genes revealed two regions of sequence similarity. Electrophoretic mobility shift assay confirmed both of these regions to be sites of tissue-restricted protein binding in vitro. The more 3′ similarity region also shared sequence with a region in the mouse Thy-1 gene 5′ flanking region, suggesting that this sequence may be a cis-acting regulatory element common to all three genes. Thus, the promoter regions and exonic organization were similar in the human CD7, mouse CD7, and mouse Thy-1 genes.